Accurate prediction of the hydrographs of outburst floods induced by landslide dam overtopping failure is necessary for hazard prevention and mitigation. In this study, flume model tests on the breaching of landslide dams were conducted. Unconsolidated soil materials with wide grain size distributions were used to construct the dam. The effects of different upstream inflow discharges and downstream bed soil erosion on the outburst peak discharge were investigated. Experimental results reveal that the whole hydrodynamic process of landslide dam breaching can be divided into three stages as defined by clear inflection points and peak discharges. The larger the inflow discharge, the shorter the time it takes to reach the peak discharge, and the larger the outburst flood peak discharge. The scale of the outburst floods was found to be amplified by the presence of an erodible bed located downstream of the landslide dam. This amplification decreases with the increase of upstream inflow. In addition, the results show that the existence of an erodible bed increases the density of the outburst flow, increasing its probability of transforming from a sediment flow to a debris flow. 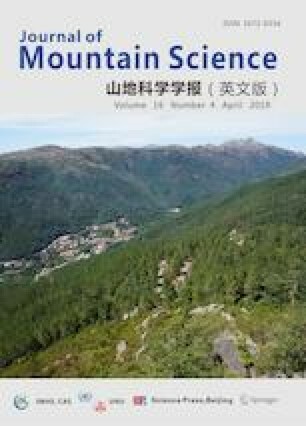 The authors acknowledge the financial support from the National Natural Science Foundation of China (Grant No. 41731283), the Key Research Program of Frontier Sciences, Chinese Academy of Sciences (CAS) (Grant No. QYZDB-SSW-DQC010), and the Youth Innovation Promotion Association, Chinese Academy of Sciences (CAS).